What Did You Say? What Do You Mean? 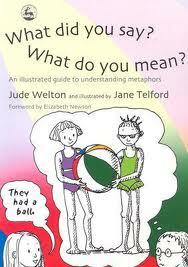 : An Illustrated Guide to Understanding Metaphors by Jude Welton, Jane Telford, and Elizabeth Newson. This visual workbook looks at a hundred of the most common figures of speech and is designed as a springboard for family and classroom discussions. Each figure of speech is accompanied by an illustration showing its literal meaning, which will help AS children recognize and learn to enjoy metaphors and figurative language. Pp. 128. This entry was posted in Books for Children, Communication, Our Library and tagged Autism Spectrum Disorder, books, books for children, Communication, visual support. Bookmark the permalink.